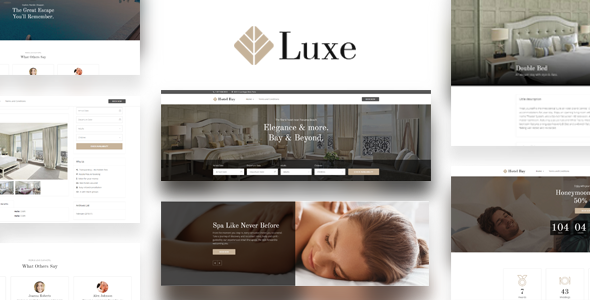 Luxe is the most charming, luxurious and powerful WP template for Bed and Breakfasts, hotel, hostel, resort, vacation room/apartment rental services. Its original goal is to help you easier manage your rooms listings, customer bookings and reservations online, pricing plans and coupons. With its beautiful design, and high coding quality, this theme can showcase your unique accommodations to the world and attract more visitors to your website. Smart and Powerful Advertisement – Luxe has a very fast Mega menu solution that can be enabled via WordPress native menu screen and you can font awesome icons to any menu elements. Create and Manage Room with WP Hotel Booking – Create unlimited rooms with different extra setting options including room price and room status management. Set Price for Specific Dates – Room price can vary by days, weeks, months or even a whole year and entire seasons. Create and Manage Booking – All bookings will be stored and changeable. Especially, admin can change the booking status from Pending to Completed and vice versa. Integration with Contact form 7 – Still hesitate about online payment method? No worries, WP Hotel Bokking also supports offline payment, which is useful for people who would prefer to mail a check. Advanced Options for Adult and Children – Easily change the number of guests (adults or children), not only for room types but also for each individual room. Mega Menu – Using Visual Composer and our built-in brilliant advertisement locations, you can put your advertisement anywhere in your website. Layout and Slider Combinations – Luxe offers over 300 layers and sliders combination only to stylize it the way you like. The layers and sliders are unique from each other and of course it is customizable. Google Font – Along with huge variations of layout and sliders, Luxe offers more than 500 Google fonts. Hundreds of free, open source fonts from google and they are really fast in rendering also. Blog Layout – Luxe offers chic and tasteful blog layout with different type of blog post formats like image, slider, gallery, video and quote. Now you can totally fall in love with your own website. Header and Navigation Style – Luxe has various beautiful header and navigation options available just to match your taste. Choose the one that screams your personality. Cool Readymade Layouts – For you to create beautiful website as desired, we have included lots of page layouts in the Luxe theme. Design your website with blog, videos and other contents. Page/Post Customization – With Luxe you can easily customize your specific page or post on the top of the default theme settings in case if you want to emphasis any page/post or need different style for your overall website. Unlimited Sidebars – Another mentionable feature of Luxe is, it allows you to add unlimited sidebars as per your requirement and assign many numbers of your choice of widgets to them. Amazingly, you can even switch the placement of the sidebars wherever you want to very easily. This entry was posted in Wordpress Themes and tagged apartment, bed and breakfast, bnb, booking, depositfiles.com, download free, download rar, download theme.rar, download theme.zip, download wordpress theme, download zip, free, free wordpress theme, get rar, get zip, hotel, hotel booking wordpress theme, hotel theme, hotel WordPress Theme, hotel wp theme, Index Of, mirrorcreator.com, motel, motel wordpress theme, nowdownload.ch, nulled, nulled theme, Parent Directory, rar, reservation, resort, resort wordpress theme, rooms, ul.to, zip, zippyshare.com by wordpress. Bookmark the permalink.